« The 31st Cape May Jazz Festival April 17-19 2009 "Legends and more Blues"
Cape May is situated at the southern most point of NJ and is surrounded by water. It is a haven for fisherman offering large purse shark,marlin and tuna fishing tournaments annually with some in spring and other in summer. Cape May also offers daily charter fishing with many options available at Jersey Cape Marina just minutes away from historic Cape May hotels and Bed and Breakfast. If surf fishing is your passion then Cape May offers several options. The marina area under the Cape May bridge is popular as is the jetty by Cape May point. Jim’s bait and tackle offers insight as well as reasonable rental rods. There are other tackle shops in and around the marina area. 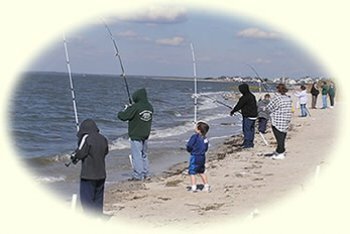 On your next stay in Cape May try fishing. It is a relaxing day that offers fun for one or the whole family. If you are looking for accommodations on your next fishing trip try the Bacchus Inn Bed and Breakfast at 609.884.2129. It is just minutes from the Cape May marina in Cape May NJ. This is a good reference website for Cape May. This entry was posted on Thursday, April 30th, 2009 at 4:43 pm	and is filed under Uncategorized. You can follow any responses to this entry through the RSS 2.0 feed. Both comments and pings are currently closed.